Dickinson has claimed the Helmet Bowl II National Championship, a nationwide competition pitting helmet designs from across NCAA divisions against one another. Sponsored by Helmettracker.com, the Helmet Bowl is based on free, daily fan voting, and the Red Devils helmet was the top vote-producing helmet in the country, covering all NCAA divisions. "It's great to get positive exposure and gain the ability to push our brand at a national level," says Brad Fordyce, head coach of Red Devil football. 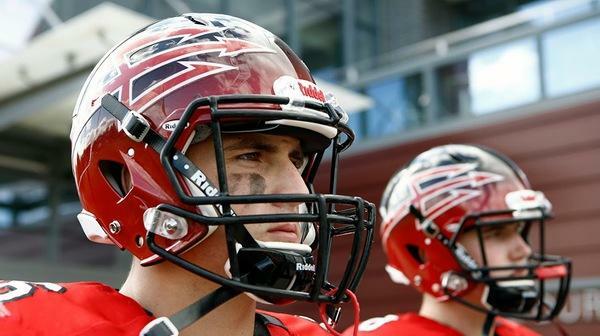 The competition began with nearly 800 helmets from every college, conference and division across the NCAA. The Red Devils captured the Centennial Conference title and earned the top seed in the East Region, advancing to the final 64-team field. Dickinson squared off with the Tulsa Hurricane in the final showdown and won the title by a large margin. "Our goal is to win in all we do, and this competition was an incredible avenue for Red Devil nation to rally together and support our student-athletes,” says Assistant Athletic Director Christian Payne. “Dickinson has many generations of dedicated people who love our football program, and our Dickinson Football Parent Club network stepped up and led the charge." Learn more about Dickinson athletics.